Annual Passholder blockouts start to ease, and Sunday is PhotoPass Day! Read on to find out about this and more in this week’s Disneyland preview. Sunday, August 19 is PhotoPass Day! Those of you visiting the parks can expect to find several Magic Shots and props that will only be available on Sunday, plus special character interactions. This includes, for example, the opportunity to meet Captain Hook and Mr. Smee (near it’s a small world), or have fairy wings added to your back via Magic Shot (near Pixie Hollow). You can find more details here. If you’re a pin trader, you’ll hopefully be at Disneyland on Thursday, August 23 for Pin Trading Night. It runs from 7-11 p.m. at Star Wars Launch Bay, and costs $15 to attend. The event is already sold out, so if you aren’t already registered, you’ll unfortunately need to wait for the next one. Details can be found here. Also, we’re nearing the end of Pixar Fest, which runs through September 3. This festival includes Pixar-themed fireworks (Together Forever – A Pixar Nighttime Spectacular) and the Pixar Play Parade at Disneyland Park, and the return of Paint the Night at Disney California Adventure, in addition to other Pixar-focused activities and opportunities, like character greetings and so on. There will also be special dining opportunities available, including Alien Pizza Planet at Disneyland Park. You can find more information in Rikki’s preview of the Festival. 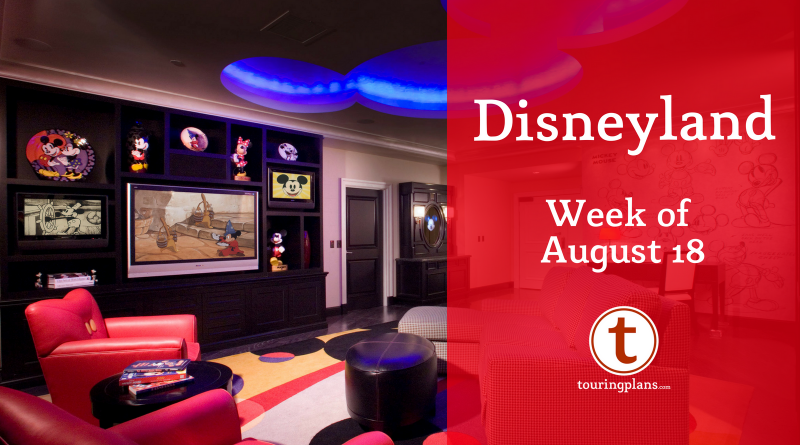 The Annual Passholder Corner is returning for the last 2 weeks of the festival, starting on August 20. It’s located at Paradise Gardens, so make sure you passholders stop by for your Incredibles-themed decals and a special photo opportunity. Crowds continue to ease, even with the phase out of Annual Passholder blockouts during the week. 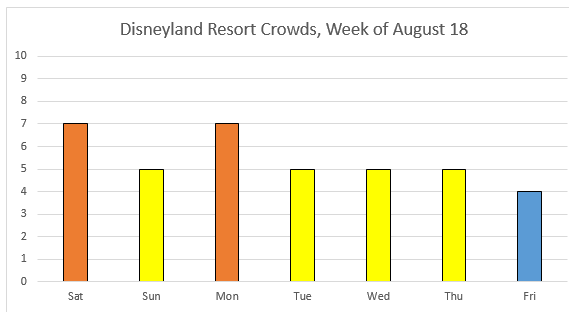 Saturday and Monday are predicted to be the busiest days, with Friday having the lightest crowds. 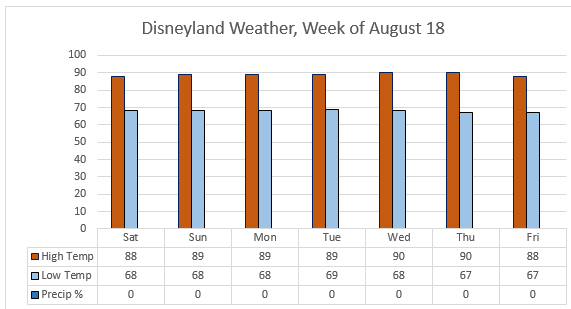 This week’s forecast calls for another warm, dry week in Anaheim. The forecast is essentially identical every day, so weather shouldn’t really impact when you visit this week. Despite the waning crowds, Disneyland will still be running a complete slate of shows this week. Disneyland continues its special Pixar Fest shows, with the evening fireworks at Disneyland Park being replaced by Together Forever – A Pixar Nighttime Spectacular (featuring a flying Buzz Lightyear!) and the Paint the Night parade reappearing at DCA with a new Incredibles float. Also, the Pixar Play Parade joins the daytime schedule at Disneyland Park. Fantasmic! will continue to run, with two shows nightly all week. Detailed show schedules, including smaller diversions like Jambalaya Jazz, can be found here. Passholder blockouts start to phase out this week. Southern California Select Passholders are blocked out Saturday, Sunday, and Friday, with Southern California Passholders blocked out on Saturday and Sunday only. All other passes are honored every day this week. For those of you buying tickets as day guests, single-day tickets are at Regular Price ($117/$110) Saturday, Sunday, and Friday, and Value Price ($97/$91) the remainder of the week. Both the Matterhorn and the Enchanted Tiki Room are in the midst of indefinite refurbishments at the moment; we’ll let you know when Disney announces their anticipated returns. World of Color remains offline until further notice on account of some “technical difficulties” with its refurbishment — we’ll let you know when we have a better idea of when it will return as well, but we are not anticipating it back until the latter part of the year. 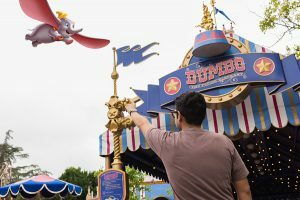 All other attractions are currently operational, but as always, be aware that refurbishments can pop up unexpectedly, so check out our refurbishments page for details on exactly what will be down and for how long. Looking ahead, Turtle Talk with Crush and the Animation Academy are going on indefinite refurbishments starting on August 27. Disney recently announced that “a bug’s land” would be closing to make way for more Marvel attractions at California Adventure. It will be going away for good on September 4, 2018, so make sure you plan ahead if you’d like to see it before it disappears.